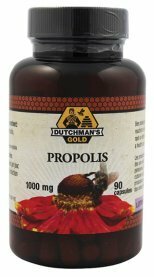 Available in 90 cap bottles, our Propolis contains 500 mg of Propolis. This premium product is manufactured according to GMP Practices in an ISO 9001 facility. Our Bee Propolis Chunks are organic, raw propolis pieces straight from the hive. Each chunk is approximately 500 mg's of pure propolis but can be up to 1000 mg's in size. Important: This product is by nature, quite hard and resinous, meaning it can stick to the teeth. When chewed it can turn the teeth brown in some people. Normally this issue is not permanent but if either of these issues is a concern for you, please consider using one of our liquid tinctures instead. It can take several days to remove the dark resins from the teeth if chewed. Please note due to the process of breaking the propolis into chunks, there will be some propolis powder in each bottle. 100% organic raw propolis (American sourced). Keep propolis chunks cool. Best stored in the fridge. 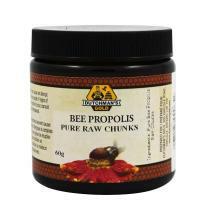 Q - What is the best way to consume raw propolis chunks? A - I suggest you simply chew the propolis chunks like gum. Chew it for as long as you can. By chewing the propolis you get a couple of benefits - you are consuming propolis in its most natural, raw form and your saliva glands will do most of the absorption. By chewing propolis, you are also doing your mouth, particularly your gums, a huge benefit. 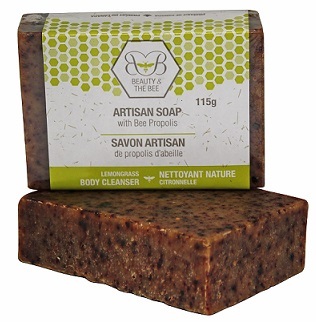 Propolis is very antibacterial and there is a tremendous amount of bacteria in our mouths. Q - Can I swallow the propolis chunks whole? A - Yes, you can but swallowing propolis whole will reduce the time that your stomach has to extract the potent enzymes and bioflavonoids from the raw chunks. It is best to chew them first and then swallow. You can also put a chunk into a ziploc bag and gently pound it into tiny pieces. You can then mix with a beverage and drink it that way with no chewing. Q - How many chunks should I chew daily? A - For general health, chew 1 - 3 chunks daily or as recommended by a health care practitioner. More can be consumed for therapeutic purposes. Q - How much propolis is in each chunk? A - Each propolis chunk is different in size but the chunks generally range in size from 500 mg's to 1000 mg's in weight. There will be chunks smaller and larger than this in each bottle but the majority are in this range. Q - If I chew the chunks and I end up with propolis on my teeth, how do I remove the dark resins? A - Brushing your teeth with Coconut Oil and Baking Soda is an effective remedy for this but not guaranteed. We strongly recommend you use a liquid tincture or capsule product instead of the chunks if this is of any concern to you. Q - Can I chew Propolis Chunks if I have dentures. A - No, this is not recommended. Available in a 30 ml bottle, our Acai flavoured Alcohol Free Propolis tincture contains 167 mg of Propolis per serving. It is 18% Propolis. This premium product is manufactured according to GMP Practices in an ISO 9001 facility. 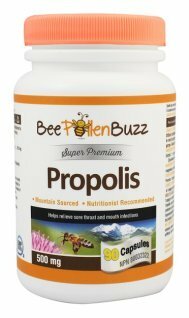 We're not afraid to say that this is the best tasting Propolis on the market! It has a delicious fruit flavor and will not stick to your teeth! Kids love it! 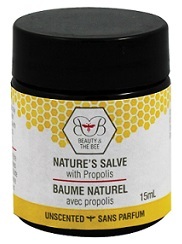 Bee Pollen Buzz Super Premium Propolis tinctures have attained NPN status with Health Canada, indicating this product meets the ultra strict standards of the Natural Health Product Directorate of Canada, one of the strictest and most advanced natural product regulatory bodies in the world. You can be assured that this product is manufactured according to the absolute highest nutritional supplement standards globally. For general health, take 25 drops (1 ml) per day with or without food. Bee propolis, Acai fruit extract, glycerine, purified water. Calcium carbonate, glycerine, aqua, xylitol, caprylyl glucoside, Chondrus crispus powder (carrageenan), Glycyrrhiza glabra (licorice) root extract, Propolis, Mentha arvensis (peppermint) leaf oil, fennel oil, menthol, spearmint leaf oil, tea tree leaf oil, Chlorophyllin-Copper Complex, xanthan gum, maltodextrin. 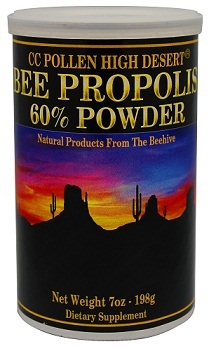 Bee Propolis Powder 7 oz. CC Pollen's Bee Propolis powder is North American sourced and contains a rich variety of biologically active phytochemicals including bioflavonoids. This 2 X concentrate is perfect for your morning smoothie or for those that can't swallow pills or simply can't stomach our tinctures! Feel a sore throat coming on? Already have a sore throat? As one of nature's most potent infection fighters, it was only natural to make it available in a throat spray. We continue to get amazing feed back on this product. I keep a bottle in my purse and use it at the slightest tickle! 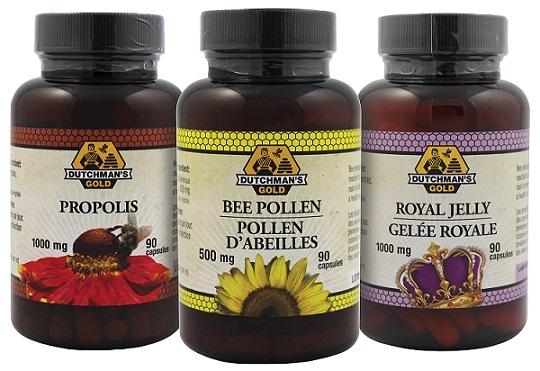 This combo pack contains one bottle of Dutchman's Gold Bee Pollen 90 caps, one bottle of Propolis 1000 mg 90 caps and one bottle of Royal Jelly 1000 mg 90 caps. This is a 3 month supply. A great value that provides great convenience for those who want to enjoy the benefits of all three jewels of the hive! 100% American sourced bee pollen, Freeze dried Royal Jelly, standardized propolis, maltodextrin, vegetarian capsule. Take one capsule of each product per day with food or as directed by a health care professional. 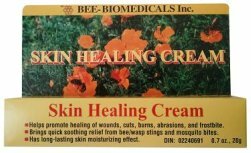 Q - I've never taken bee products. What is the best way to introduce the Total Hive Trio into my system? A - The best way to introduce bee products into your system is slowly and in small amounts. What I'd recommend when taking the Total Hive Trio is to begin with the bee pollen capsules. You'll need to twist open the capsule and dump out a few granules. Start with one granule each and increase daily by a few granules until you get to one full capsule (if you tolerate it well). After two weeks of tolerating the bee pollen well, begin taking one capsule of the propolis. You'll now be taking both pollen and propolis, one capsule each. Do this for an additional two weeks. If, after two weeks, you tolerate this well, add one capsule of the royal jelly in each day. If after two weeks you tolerate the three products well, you could consider adding additional capsules of one or more products to your daily intake based on your health goals and the advice of a qualified health practitioner.